JoSAA Counselling 2019 will be started in the last week of June 2019 by Joint seat allocation authority also known as JoSAA. JoSSA is an organisation made by MHRD (Ministry of Human Resources and Development) responsible for the counselling and management in the admission at IITs, NITs, ISM, IIITs, NSITs and other GFTIs. The JoSAA 2019 Counselling Schedule is being organised after the completion of JEE Advanced Result announcement and so JEE Main 2019 AIR announcement. The applicants who are going to appear in JoSAA Counselling have required the filing of JoSAA Counselling Application Form first as this is the very beginner step of appearing in JoSAA Counselling Procedure 2019. The counselling is done for the seat allotment of those candidates who have completed JEE Main 2019 and/ or JEE Advanced 2019, Through JoSAA Seat Allotment Procedure, the eligible candidates get admission in around 34000+ colleges including IITs, NITs, ISM, IIITs, NSITs and other GFTIs. 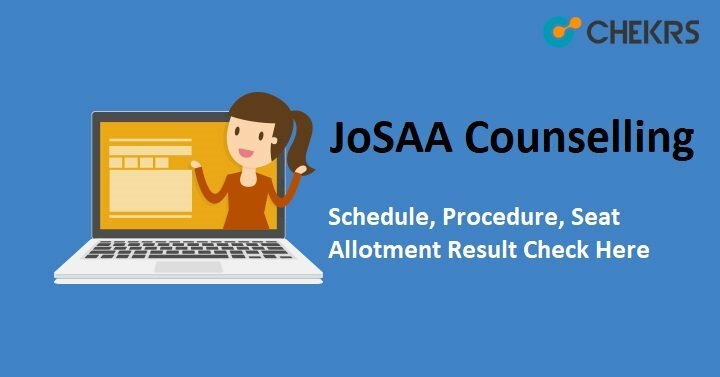 We are providing you the detailed information about JoSAA Counselling such as eligibility criteria, document verification, form , dates and so more on the same page. The applicants who are going to appear in JoSAA Counselling 2019 are required to know the exact JoSAA Counselling Process. They would require to fill the choices of the institutions from the available choices and then LOCK them. They will be then allotted a temporary seat. Later they will be called to the institution for verification of documents and then after submission of admission fee they will be allotted a confirmed seat. The applicants are required to login to the account created on the official website with the same credentials provided at the time of JEE Main 2019 Registration. They will then require choosing the name of the institute along with the branches and LOCK them. Later, Their choices will be considered as per the Rank Scored in JEE Main 2019/ JEE Advanced. At the time of reporting to the institution, the applicant is required to fill bring the following documents along with the duplicates of these. The applicant must have qualified JEE Main 2019 to take admission in NITs, IIITs, and GFTIs. The applicant must have qualified JEE Advanced 2019 to take admission in IITs and ISM Dhanbad. The applicant must have qualified XII education from a recognised institution with minimum percentages decided by the organisation. The applicants who are going to appear in the counselling will have to pay the following amount of registration fee at the time of reporting. Joint seat allocation authority will release JoSAA Counselling 2019 Seat Allotment Result. From the previous year’s announcements, it can be predicted that the JoSAA counselling Merit List will release in July 2019. We will update you the same after it get announced on the official website on this page too. Those candidates who want to take admission in Top Engineering University Admission can also check the link.